You want to go for a drive but your car stinks. Someone smells, someone smokes, your kid pooped, you lent the car to a relative and now… someone spilled cologne, you drove through a medical lab where they test viruses… you get the idea. In any event, you need an air purifier in your car. This is the only model of a smaller size that we truly recommend for a car. There are other models that we can say are probably better than nothing, but if you are serious, then this the Philips Go Pure SlimLine is the one you should buy. For starters, the Philips GoPure Slimlime uses HEPA filter, which, is preferable to ionizers used by other models. It additionally uses a HESA filter to draw in bad particles from your car’s upholstery and materials (I saw the dust on your dashboard and I judged you). There are many “standard” air purifiers for cars, but they’re all quite unimpressive — the Philips GoPure Slimline is at least 3x better than the others in terms of its effectiveness in cleaning and filtering out smoke, and other dangerous particles in your car. You’ve seen elsewhere on this website that the HEPA filter is best paired with a pre-filter for maximum effectiveness, and that is what Philips did in their design of the Slimline 210. If you don’t want the usual suspects of germs, bacteria, pollen, dust floating around while you drive, then the GoPure SlimLine (which is an upgrade of the Compact 200 model) is best for your car. 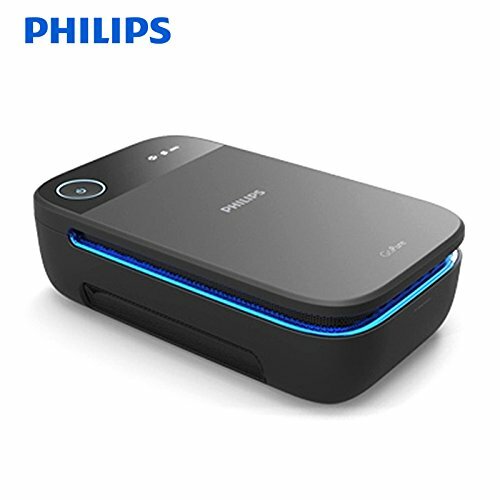 You can set the Philips Slimline 210 to turn on when your car starts so you can focus on the 900 other things going on in your life without having to worry about cleaning the air in your car. If the filter gets too dirty, a LED light will indicate that it’s time for a change. The device has 3 fan speed settings (which you could also in theory manipulate with your car’s AC). It looks like a fairly sleek gadget, with a definite modern style. Some might think it’s a PS4. It’s portable and easy to use if you need to take it somewhere. The SlimLine is quite simple to install. It comes with instructions and grips to keep it steady if you bank a little too hard. In a way, windows are your best air purifiers for cars. But if you’ve had a smell that won’t go a way (I think these is a Seinfeld episode), or your windows or broken or you don’t want to leave them open (e.g. you’re highway driving), then you know you may need to try something else. Also, space inside any vehicle is fairly limited. So while there are smaller devices you could buy, they are mostly ineffective. This is hands down the best option for car air purifiers available today. Check it out on Amazon for more information!